I had a bit of fun with this today. I think I've mentioned that I love bold bright colours and designs for my kids pages. 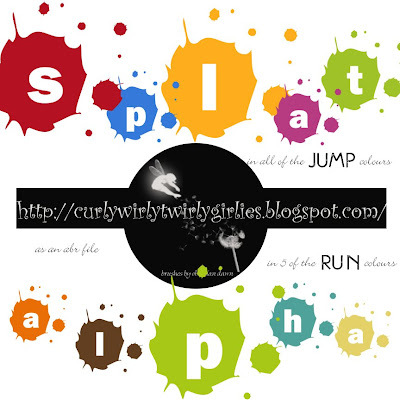 I had a go at creating this alpha to use on my kids kindy pages. The letter in the middle is actually a cut out so will show whatever is behind it. I did some in all the JUMP colours and five of the RUN colours (I know what a slacker LOL). But you can easily change it to any colour by using the .png file as a clipping mask. And I did the them as a brush set LOL - talk about creating a monster. It did end up getting tedious by the second half of the alpha LOL but you will be pleased to know that I persisted and included the numerals, an ' and a !, and in the PNG files I put a hyphen for those with hyphenated names - cannot remember if I did that in the brushes (oops). Thanks for the comments and emails about the couple of people that got cranky. It is mostly water off a ducks back, but I am big on manners (ask my poor kids), and I think sometimes we all need to remember patience and tolerance, I know I have my days. I have shot myself in the foot trying to be clever with these brush files and somehow saved over one of the ones in PSE, which I will have to figure out. For those that notice - yes I do know that I got two letters of the alphabet out of order (long story don't ask - they are all there though) and the abr file ended up being called brishes instead of brushes - that is for any kiwi digi-scrappers LOL. I am still playing with the sanded paper on chipboard. The tutorials I had relied on you using their product, which I am happy to do, but I cannot share, so I am figuring out how to do it myself. Thank you for your nice freebie!! Thanks!!! I love this alpha, especially the fact that the background shows through! Thanks for sharing. Thanks so much! I love this alpha and the brushes will be so helpful. I too love the bright and bold colors, thank you. I love what your doing with these colours! Thank you for all your hard work. When I get confident enough, I'll share mine too. Hi S - there was a problem with that like. I forgot to delete it when I reposted them - sorry about that. If you look after that you will see the papers and a new link posted. I have amended the original post - thanks for reminding me. Erika just ignore the bad commentors & focus on the genuine people who are happy. People who complain about a freebie really show what kind of character they have huh. And don't worry there are people out there who thrive on being negative. This alpha looks awesome by the way. It's goin' straight to the pool room that one! lol Keep it up!